President Donald Trump has had a lot to say on Twitter about the U.S. auto industry and its use of Mexican plants. On Tuesday morning, he spoke directly to the CEOs of General Motors, Ford and Fiat Chrysler at a meeting. In opening remarks to the press, Trump claimed he was already "bringing manufacturing back to the United States big league." He didn't talk about his threats to impose tariffs and border taxes on goods brought in from Mexico. Instead, he talked about incentives that would get automakers to build here, such as reduced corporate tax rates. The CEOs stayed at the meeting about an hour. 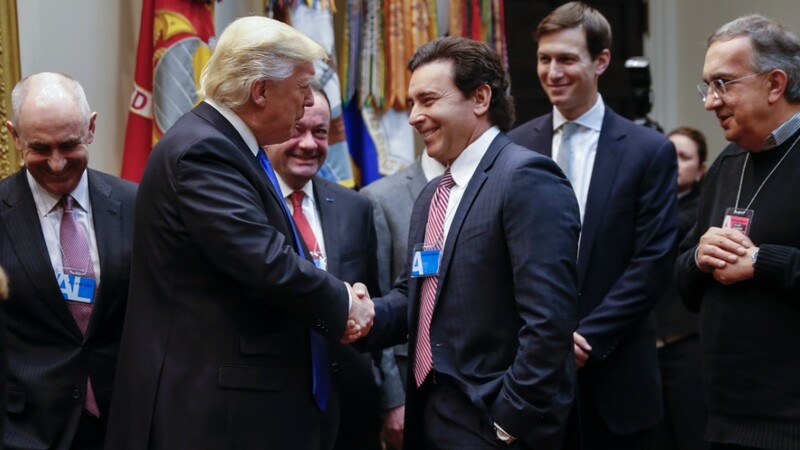 Ford CEO Mark Fields praised the new administration as they left. "As an industry we're excited about working together with the president and his administration on tax policies, on regulation and on trade to really create a renaissance in American manufacturing," he said. He specifically praised Trump's decision to pull out of the TPP trade deal, which Fields said did not do enough to address currency manipulation, a major concern for U.S. automakers. But the auto industry is concerned about Trump's threat to impose a 35% tax on imports from Mexico to the United States. All major automakers have plants and suppliers on both sides of the border. Automakers have said that what they really want is to know what rules will apply in the future, especially for imports from Mexico. "I need clarity, and we need rules," said Fiat Chrysler CEO Sergio Marchionne at the Detroit auto show this month. Asked by reporters Tuesday if Trump had discussed specifics of regulations and trade policy, Marchionne responded "Not yet." Before the meeting started, Trump said in a tweet that he was focused on boosting manufacturing. "I want new plants to be built here for cars sold here!" But executives from the automakers who have been most active building new plants in recent decades weren't at the White House today. Toyota (TM), Honda (HMC), Nissan (NSANF) and Hyundai, which have U.S. plants as well as plants in Mexico, weren't invited to this meeting, according to spokespeople from those companies. Between them, foreign automakers employ tens of thousands of workers at their U.S. facilities. A trade group that includes the big Asian car companies, but not BMW or Volkswagen, says its members employ nearly 100,000 people in the U.S. with a total annual payroll of $7.6 billion, and produce about 40% of the cars assembled here. BMW and VW have about 12,000 workers between their plants in Spartanburg, South Carolina, and Chattanooga, Tennessee. The BMW Spartanburg plant is the company's largest in the world, and also the largest exporter of cars in the U.S. It sends about 70% of the 400,000 cars it builds annually to other countries. The White House didn't respond to questions as to why the foreign automakers weren't invited to Tuesday's meeting or if they'll be included in future auto industry summits. GM (GM), Ford (F) and Fiat Chrysler (FCAU), the traditional Big Three Detroit automakers, have brought a lot of jobs back since the industry bottomed out in 2009. Together, they now have more than 230,000 employees in the U.S.
Each Detroit automaker says it has added at least 25,000 U.S. jobs since 2009, increasing their employment in the country by about 50% or more. Those U.S. job gains exceed each company's total employment at their Mexican plants. And the three Detroit automakers have announced additional U.S. hiring and investment plans since Trump's election, but they have insisted the decisions were made independently of him. Many of the plans were promised in 2015 labor deals with the United Auto Workers union. On Tuesday, Trump also pledged to make U.S. environmental regulations "extremely hospitable" to business. "It's absolutely crazy," Trump told the group at the White House. "I am to a large extent an environmentalist. I believe in it. But it's out of control. We're going to make a very short process. Generally speaking we're going to give you your permits. We're going to be very friendly." Despite the hiring and investment plans announced in the U.S., most of the automakers' Mexican operations are due to stay in place. Ford announced last month that it would cancel plans for a $1.6 billion plant in Mexico to build small cars. But the car that was to be built there, the Ford Focus, will now be made at a different Mexican plant. Weak sales of small cars, more than Trump's threat of tariffs, were why plans for another Mexico plant were canceled. Only GM has announced it intends to move jobs from Mexico to a plant in the U.S.